Libya has the largest proven oil reserves in Africa, at more than 3 per cent of the global total — and there could be a lot more undiscovered. Libya is not the only African nation in turmoil. Somalia’s drawn-out conflict has been called ‘a slow genocide’. But there’s little sign of US or European military input. And it is a similar story on the other side of the continent. Somalia’s parliament sank into chaos: The no-confidence motion was introduced by supporters of President Hassan Sheikh Mohamed, who recently rejected a move by the prime minister to reshuffle the cabinet. 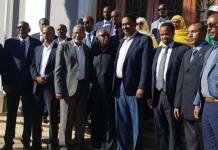 Somalia’s international supporters are concerned the political tension could slow down or derail efforts to stabilize the country after more than 20 years of violence.